Upper Floor Apartment with Sun Terrace, Shared Pools, Gardens & Private Parking. NEW TO LISTINGS WITH THE INTENTION OF GAINING EXCELLENCE STATUS QUICKLY - Luxury penthouse apartment (upper floor + sun roof terrace) with shared pool and gardens, own sun terrace with panoramic, sunset views over La Finca golf course, mountains and quiet, peaceful countryside. We are far enough away from the hurly burly but close enough for a short trip to the fabulous beaches and a great evening out. The apartment is superbly located within a very tastefully designed cluster of traditional style apartments. It overlooks the golf course tees, clubhouse/ bar/ café & restaurant of a highly rated championship golf course on one side, and our community garden and pool on the other. Inside, enjoy a very tasteful furnishings with a well equipped kitchen (we love cooking), two decent size bedrooms with comfortable beds , linen, towels with air conditioning & heating + free WiFi, Sat TV & DVD. Outside on the living room level is terrace with table, chairs and gas BBQ. Upstairs is the large sun terrace with sunloungers, side tables charcoal BBQ and clothes dryer. I always get repeat bookings from friends and family who give it a 5 star rating so it is well tried and tested and now ready for excellent holiday letting. In just over a minutes walk is a small cluster of shops including a general food store, chemist, cafes, bars, restaurants and ATM. The local village of Algorfa is just 2km away. Everything you need in a luxury bathrooms plus towels. In both bedrooms. Please do not leave the units on all day or all night as this will register excess use and a further cost. There is the heating mode on the air conditioning and also separate plug in units. We provide enough for your stay. A good machine that is simple to use. There is one but has never been used. Private gated car park next to the apartment. We provide enough for your stay though pease don't take them to the beach. Cream leather setting and tasteful rustic style furnishing. Easy to clean ceramic hob. Well equipped and with good appliances. Large contemporary wooden table with 6 leather chairs. Satellite free to air service with all the major English speaking channels and several hundred others. Enjoy a reasonable range of books. Assortment of popular board games. The communal garden is extremely well kept by our gardeners. Downstairs terrace with outdoor dining facilities next to living room sliding doors. Large upstairs sun terrace with loads of space inc. sun beds, storage for cushions, clothes dryer and great views. There is a club just a few mins on the road to the local village. Our own top quality, competition course at La Finca with driving range, putting practice hole and club house with great facilities a close to three other high quality courses within a short drive. Our communal pool along - with a section for young children - is very well looked after and seldom busy. BOOKING: Non refundable deposit & full payment 6 weeks prior to arrival. THE QUOTE: Includes total price and security/ damage deposit which is refundable 7 days after checkout. Except for: CLEANING FEE: There is an additional cleaning charge of 50€ plus 10€ per person paid locally to agent - hence lower rates. CHANGEOVER / ACCESS: Changeover days are flexible & access is usually 10.30 - 4.00 but at times can be flexible. LATER CHECKOUTS: Can be arranged but will incur a small fee. LONGER TERM LETS: Can be arranged. Preferably a 6 month stay would be during the winter months LOCAL INFORMATION: You will receive an information pack with all you need to know about the apartment and much else a week before you go. Year round sunshine, cooling sea breezes in high summer and low humidity year round. Many are only just a bit longer than 15 mins drive. La Finca has its own superb championship quality course in surrounded by orange and lemon groves and is a short drive from 3 other top quality courses. A long coastline of award winning white sand gently shelving into a warm sea - perfect for all of us. Favourite beach at La Marina has a natural park of palm eucalyptus trees and pine dunes for great parking & picnics. Visit the salt lagoons to see the occasional flock of flamingos and a variety of wild birds. Sit in the plazas, drink at the local bars, cafes and restaurants enjoying a more sedate lifestyle watching continental life roll by. 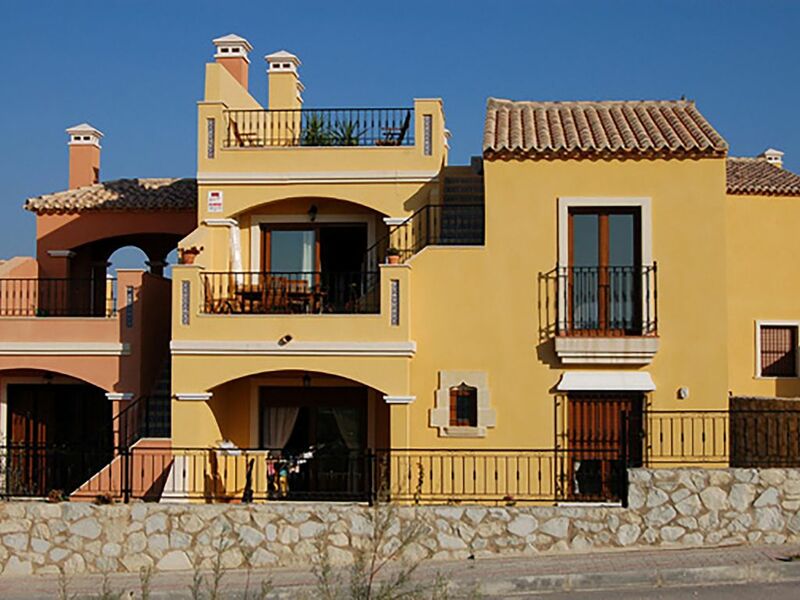 Local nearby villages & towns of of Algorfa, Montesinos, San Miguel, Almoradi and Orihuela, or drive in to the rugged mountains to Guadalest village with its castle courtyard. A visit to the cities of Cartagena & Murcia will satisfy any desire for history, culture and the arts. Alicante - a coastal city with tree lined boulevards, a fabulous marina, sophisticated shops, restaurants and excellent tapas bars. Visit Elche for it's palm trees and safari park, the Mar Menor for its mud baths; Santa Pola for its castles, museum and aquarium, or Fortuna with its roman site and hot springs for swimming and remedial benefits. Water front promenade of cafes, restaurants, a marina; huge market on Fridays, good shops, bowling, a cinema, a water park and a lively nightlife with casinos, clubs, and bars. To both airports at Alicante and Murcia is close by and makes for really easy door to door connection.